Offer clients all the luck they could hope for. 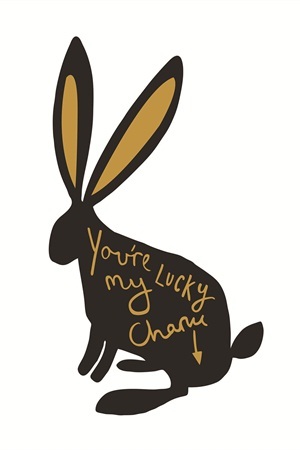 March calls for a little luck — whether clients want to be lucky in love, need a little boost in their careers, or are searching for the perfect good luck charm, we have the perfect retail items. Give them all the luck they could hope for. The Old English Company produces a range of lovely prints, homeware, and stationery that people love to own and share. The Rabbit print features Old English’s signature style of typography of paintbrush strokes and will add some charm to your wall. The company offers many items in a range of colors and products that can be customized with dates or names to create unique personalized gifts. Madeline Trait’s Shooting Star Cake Topper is a sparkling addition to any party for any occasion. Cut from 1/8” plywood and then hand painted and dipped in glitter, all cake toppers are intended to be kept long after the celebration is done. Clients can decorate their cakes, cheeses, or a stack of pancakes as something long-lasting for special occasions. Victoria Z Silver’s amulet Hamsa and Evil Eye rings keep evil energy away with style. Each one comes in silver, gold, or rose gold with added cubic zircon crystals, and in a variety of styles such as a bracelet/ring combo, amulet double-banded style, or as a knuckle ring. A Little Dazzle’s clover studs showcase the lucky chances of finding a four-leaf clover. According to the Irish tradition, each leaf on a four-leaf clover represents something special. The first is for faith, the second is for hope, the third is for love, and the fourth is for luck. Today, these special symbols are seen adorned on pieces of jewelry all over the world. 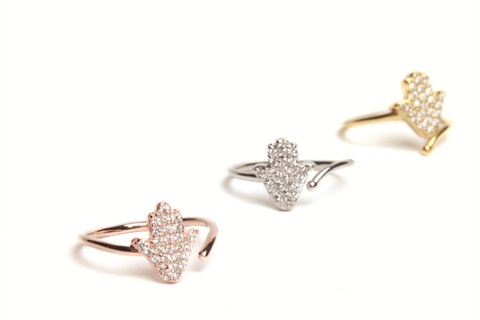 Jennifer Rex Jewelry handcrafted jewelry is inspired by all things dainty and delicate. This horseshoe necklace is made from a lightweight gold or silver wire, slightly hammered for texture, and hangs from an 18-inch chain. Each pendant is made individually by hand and is completely unique. This simple, understated necklace is perfect to wear alone or layered with a handful of your clients’ favorite necklaces. Three Pine Apple’s has an ever-changing variety of kitchen textiles, pillows, tees, and cards inspired by the seasons and beloved New England. As a self-taught screen printer, Katy Carroll of Three Pine Apples celebrates unique and seasonally inspired designs on anything from dish towels, to onesies, to runners. If it can be drawn, carved, or stenciled, it will turn up in the shop ready to wrap.